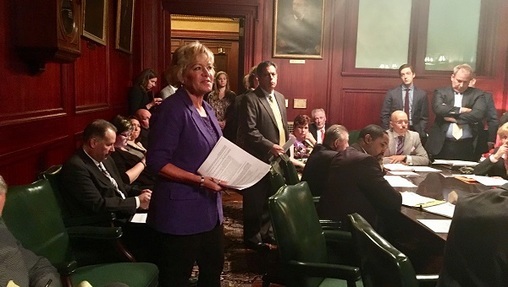 HARRISBURG, PA (WSKG) — After more than a year of on-and-off negotiation, the state Senate has moved a congressional redistricting overhaul to the floor of the full chamber. However, the compromise measure is expected to undergo significant changes before it heads to the House as soon as next week. As it stands, the bill would amend the state constitution to create an independent citizens’ commission made up of four Democrats, four Republicans, and three Independents. It lets House and Senate leaders from both parties pick eight commissioners, and the governor picks three. If the 11-person panel can’t decide on a map, the current language dictates the General Assembly would serve as tiebreakers. Several of those components have coalesced in recent negotiations aimed at securing Republican votes, and they’ve caused a number of left-leaning government reform advocates to rescind support for the measure. 14 groups, including Keystone Progress, the state chapters of the NAACP and Planned Parenthood and the Pennsylvania Budget and Policy Center co-signed a letter this week declaring “advocates of reform should not be placated” by the bill. Bill sponsor Lisa Boscola, a Lehigh County Democrat, expressed frustration with their caution. “Some of the lobbyist groups out there are stupid,” she said. Concerns aren’t just coming from outside groups, though. Six Senate Democrats opted to vote against SB22 as it passed to the floor. And even those who didn’t, like Democratic Minority Leader Jay Costa, said it needs some serious work. Among other things, Costa said the bill needs to clarify who cannot serve on the redistricting commission (for instance, lawmakers and their staff and family members), and what the requirements are for belonging to a party. He also noted “making sure that the [racial] composition of the commission is one that reflects Pennsylvania” as a problem area. Boscola said a sweeping amendment is being drafted that’ll address some concerns. For instance, she said it would let the state Supreme Court end stalemates instead of the legislature. Separate redistricting measures are also in various stages of completion in the House, though none are as far along as SB22. There is still little agreement between the chambers on what the final bill should contain. If lawmakers want to keep the amendment effort on track to take effect before 2021 redistricting, it has to pass the Senate and House by early July.